It is not an impression of the painting of Leonaldo Da Vinci's Mona Lisa of a musical variation. It composes a score from an image directly. 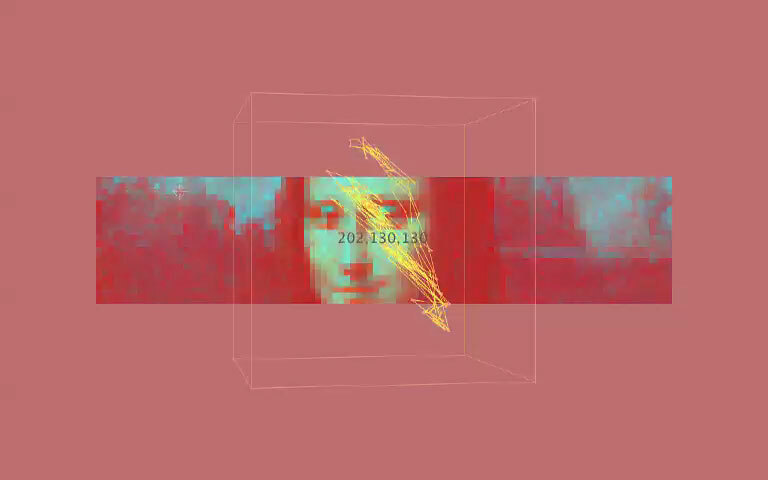 This Mona Lisa music is one of the RGB music project. The music and 3-D drawing were converted RGB (Red, Green and Blue) value of an image by RGB MusicLab which was programmed by Kenji Kojima. It reads RGB value of pixels from the top left to the bottom right of an image. One pixel makes a harmony of three note of RGB value, and the length of note is determined by brightness of the pixel. RGB value 120 or 121 is the middle C, and RGB value 122 or 123 is added a half steps of the scale that is C#. Pure black that is R=0, G=0, B=0 is no sounds. Synchronized 3-D drawing follows the RGB values along an XYZ axis of the image. The lines become a distinct topography - a visual map of the both the musical score and pixel content.